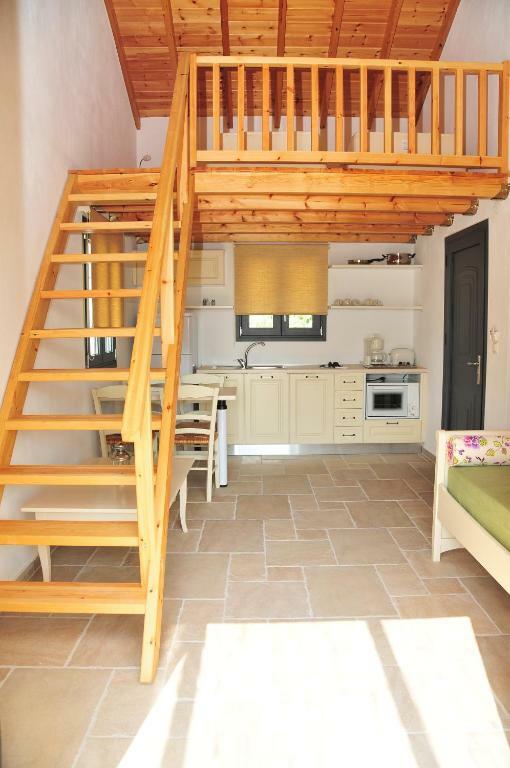 Proximity to Kolios beach, modern, well equipped. Very secure. Well designed and equipped. Good location for one of the best beaches. Well looked after and maintained. The cleanliness, the location, Kleopatra the owner. Everything was immaculate when we arrived. There was a regular towel change which we enjoyed and we also liked the fact that there were only a few villas, which made it very personal. Well furnished and comfortable apartment in a fantastic location - one minute from a lovely bay and beach. Housekeeping was excellent, direct access to the beach, spacious balcony, warm welcome. The beautiful gardens were a real delight and added to the peace and tranquility of the location. Apartment was clean, modern and well furnished. The view from the balcony was beautiful, overlooking Kolios bay and the facilities that the apartment provided were excellent. All members of staff and the owner Kleopatra were very helpful and friendly. Location was perfect. 100 meter from private Beach which we find was the best Beach on the Island. It was in a bay so no waves, really clean and clear Water with lots of fish. The tavern on the beach makes delicious food. House was good insulated so it was nice an Cold when we come back at the house after spending time in the warm sun. Cleaning was excellent. Location excellent, secure, clean and very friendly host. Όλα ήταν υπέροχα.Ευχαριστουμε την Κλεοπάτρα για την φιλοξενία της.Το συνιστούμε ανεπιφύλακτα για όλους. Lock in a great price for Kleopatra Villas - Seaside Suites – rated 9.8 by recent guests! The modern complex Kleopatra Villas is just steps from the sea. It features individually furnished villas with free WiFi. Each sunlit studio and apartment is spacious and tastefully furnished. Air conditioning and safe are standard. Bus service connects the villas with the port of Skiathos, 3.1 mi away. There are taverns, bars, and mini markets along the road. This property also has one of the top-rated locations in Kolios! Guests are happier about it compared to other properties in the area. 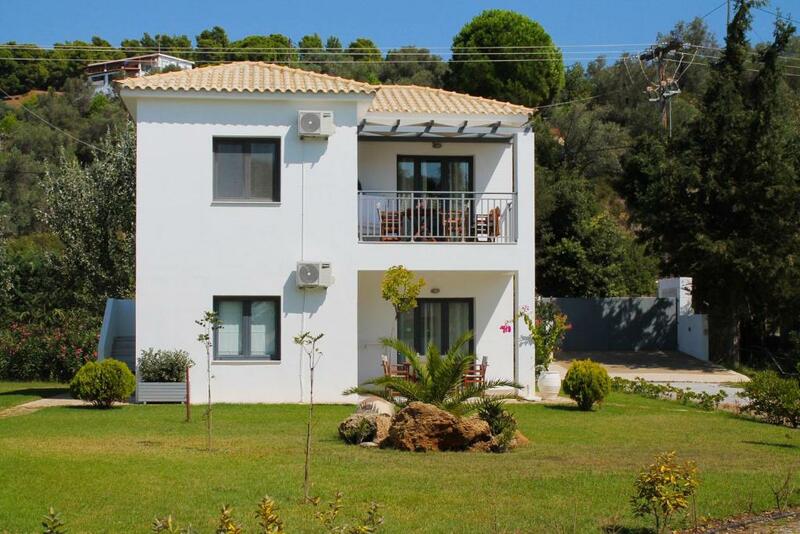 뀐 Located in the top-rated area in Kolios, this property has an excellent location score of 9.7! When would you like to stay at Kleopatra Villas - Seaside Suites? This spacious apartment offers a private bedroom with a double bed and a second room with a fully equipped kitchen and all cooking facilities, including a toaster, a coffee machine and an oven. The private bathroom is stocked with complimentary toiletries and a hairdryer. It opens up to a patio where guests can enjoy the garden views. Kleopatra Villas is a beachfront newly built complex (since 2011) that consists of 5 individual villas in a 4 acres land which is located just in front of Kolios beach of Skiathos island. Kolios is a beautiful settlement, just in the middle of the island. It lies just 6 km from Skiathos Town and 6 km from the famous and cosmopolitan beach of Koukounaries. Kleopatra Villas is an ideal choice for families with young kids as well as for elderly people whose priority is to have direct access to the beach without any need of using car. Also couples and friends that looking for relaxing and calmness can enjoy our place. Our purpose is to provide all the amenities and the privacy to people that love the sea and the nature and want to explore the hidden beauty of the island of Papadiamantis and its traditions. Each of the 5 villas consists of 2 separate suites (one on the ground floor and one on the 1st floor) that can be rent separately. Looking for a wedding at Skiathos island? Would you like to feel like being the lead actor of a Mama Mia wedding? Here we can host you and your families like being home! Kleopatra Villas is a family business. Our priority is to make you feel like being home and to have all the comforts that you might need to enjoy your holidays! Kolios is the ideal starting point to explore the island of Skiathos, either by your own car or by bus, as bus stop n.14 is right outside our accommodation. For the lovers of hiking, there are numerous paths leading to beautiful, small beaches. The beach of Kolios is full of pine trees that reach the turquoise waters, creating idyllic pictures. It is an organized beach with all the amenities to enjoy your favorite water sport. Along the coastline you can find various taverns, restaurants, bars and super markets that will make your stay in the island easier. Market and restaurants can be found in a walking distance. Kolios beach is an organised beach which provides sunbeds and umbrellas for rent. On the beach you can find a traditional restaurant with fresh fish and meat which is open all day to serve all your needs . The bay is ideal for hosting your boat. House Rules Kleopatra Villas - Seaside Suites takes special requests – add in the next step! Kleopatra Villas - Seaside Suites accepts these cards and reserves the right to temporarily hold an amount prior to arrival. Please inform Kleopatra Villas - Seaside Suites of your expected arrival time in advance. You can use the Special Requests box when booking, or contact the property directly using the contact details in your confirmation. Quite close to road , so some traffic noise. I initially missed having a pool, but we soon got over that and made use of the beach! I didn't find the pillows very comfortable at all, but apart from that everything was ideal. The electric was off when we went out so the air con didn't work. It was a bit Cold during the night and we could use a thicker quilt istead of just the cover. The path to the Beach is with rocks and several ant house so we had to carry the kids through it.